Time for another TamiyaBlog build. 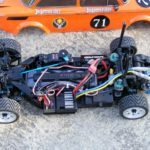 We love the Tamiya M-Chassis series a lot. And over the years, I´ve collected myself nearly all of them. From M-01/02 to the actual M-05/06 and M-07. 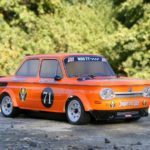 Especially the classic Tamiya M-chassis bodies are close to my heart. 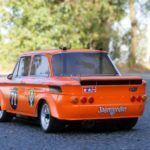 The NSU TT suits perfectly into the range like the Abarth 1000 TCR, Alfa Giulia GTA, Mini Cooper, Alpine A110, and Honda S800. 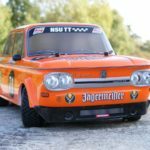 Tamiya´s NSU TT “Jägermeister” Version is the one used by ” Willi Bergmeister” from 1974, the winning car of the 1974 “Bergmeister” Championship. 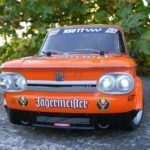 Unfortunately, Willi´s name is not placed on the car, maybe due to licensing issues. 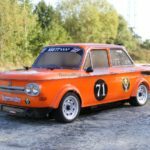 The NSU was very succesfull in “Bergrennen”, during the 60´s und 70´s, and fought against Fiat Abarth, Alfas, and Alpine A110, only to name a few. And the scene is still alive. Some enthusiasts kept their cars, and you can still see them on smaller “Bergrennen” today. 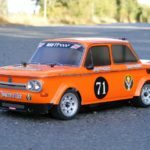 The Tamiya body is, as always, a very well reproduction of the original car, but it sits on the M-05 chassis, which is front wheel drive. 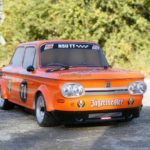 The original NSU Prinz and his TT and TTS versions where RWD cars. 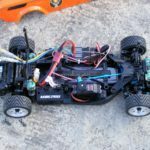 So we thought it would be much better to place the body on a nice M-06 Pro chassis, i had for a while. The body sits well on the M-06. There is enough space under the TT body for the M-06 rear motor. 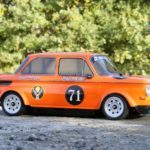 The wheels of the Tamiya NSU kit are “borrowed” from the Abarth 1000 TCR. They suit the car well, but i wished Tamiya would have made some new wheels for the NSU. The original “Spiess” wheels from the 1970´s, which were used on the original car, looked so cool. Anyway, we took what we had, and put some nice “Pit Shimizu” racing tires on our Abarth wheels. 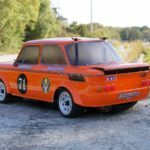 They are of great quality, and i hope, with their soft compound, they will help to give the little NSU some great grip on the rear. 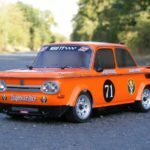 To add some more details to our cute little racer, we had the chance to build the body with the prototype of the new light bucket kit from well know german Tamiya dealer TAMICO, which is available from now on. In this kit, a front and rear LED holder is included. This will give the body the final touch, and looks really great. 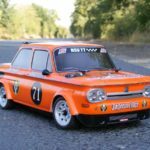 We hope Tamiya will bring some more classic racing car bodies for the M-Chassis series in the future. We still hope for the classic Lotus Europe, which was available from Tamiya as an 1/24 static kit. 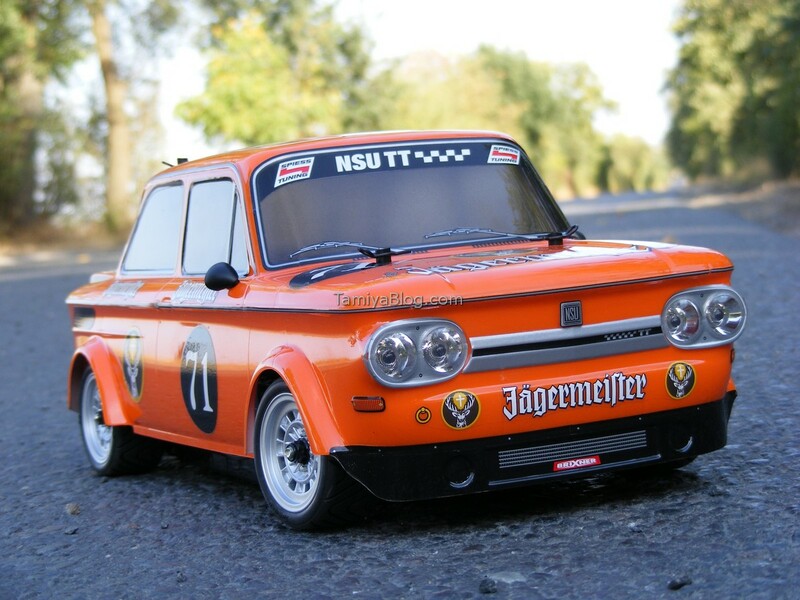 But for now on, enjoy the NSU TT ! 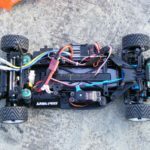 This entry was posted in Customized Builds, Reviews on September 23, 2018 by dunebuggy.